- Partial Denture: a replacement of the missing teeth and the denture is attached to the remaining teeth. 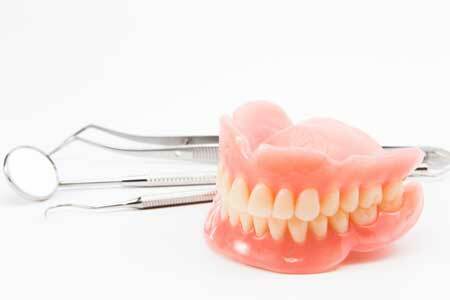 - Complete denture: a replacement of a full set of the teeth. - Implant over denture: few implants are placed in the jaw bone and provide better retention and stability to the overlying denture. - Immediate denture: a temporary denture is made in a relatively short amount of time to replace a missing tooth (teeth) as a temporary replacement until a permanent restorative dental treatment can be created. - Use a dampened washcloth or a soft toothbrush to clean the inside of your mouth gently, to remove food from ridges and soft tissues. - If you have some teeth left, use a soft toothbrush with toothpaste and clean them properly and floss approximately on daily basis. - It is important to remove dentures while sleeping to give your gum a rest. - Denture need to be cleaned properly. First fill the sink with water or lay a soft towel down as denture may break if they fall on a hard surface. - Rinse denture under warm water after each meal to remove food debris. Do not use boiling water as this may deform the denture. - You can use a soft toothbrush or a denture brush with soap or denture paste, try to avoid regular toothpaste as it might have aggressive particles and can scratch the acrylic. - Cleaning tablets can be used to remove stains and plaque buildup. Make sure to follow the manufacturer's instructions. - When not wearing the denture, always keep it in a water or a denture solution as acrylic can dry out over time.